N. b. No photographs are permitted in Cusco churches, even if you have paid to enter. The authorities erroneously believe you may get shoddy old, low-rez postcards in the event that you can’t bring your very own photos. • Sacsayhuaman, a huge Inca fortress on the slope above the city with wonderful views and amazing stonework. 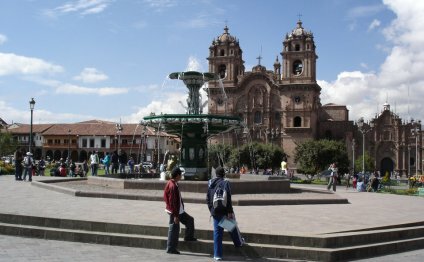 • Plaza de Armas (Huacaypata): spend time inside elegant, calm and colonnaded main square, get your footwear shined, see from the hawkers, guide trips, talk with other tourists, have actually a glass or two, meals, people-watch, encounter a festive procession, go to the churches etc. Here is the heart of Cusco. The Inti Raymi festival occurs within Summer. • Cusco Cathedral, usually known as the Cathedral Basilica regarding the presumption of the Virgin. Built-in 1654 it's operating out of Plaza de Armas, on left in image above. Unlike many churches in the remaining portion of the world tourists need to pay to enter however the inside is magnificent, full of silver (stolen from the Incas), fine woodwork and encompasses 13 varied chapels. A guide pays to. The cathedral is attached to the very first Christian church built in Cusco, Iglesia del Triunfo. • Santo Domingo Convent, Qoriqancha/Coricancha. A classic case of a stylish Spanish church built throughout the ‘Golden Courtyard’ Inca temple (walls paneled with silver ahead of the conquistadors came), today simply full of superb masonry. The first step: enter a lovely 17thC chapel through a Moorish entrance. Second step: go into the cloisters in order to find an Inca temple, mainly revealed after a quake! Brilliant. Picture. • Iglesia de Santo Domingo, Plaza de Armas, dazzling shows of items eg an excellent gold altar, fine lumber carvings and a Peruvian type of ‘The final Supper’. Baroque and Soul! No pictures permitted tho’. • Iglesia de la Compania de Jesus (Church of community of Jesus), Plaza de Armas, a lot of classy accessories and accessories and and wonderful views through the front side towers. • Wandering the roads to come across things like The twelve-sided rock. A fantastic little showmanship, this large and superbly slice is embedded in a wall in Calle Hatum Rumiyoc. Photo. • Barrio San Blas could be the arty-farty neighbourhood uphill and north of Plaza de Armas, writhing with artists-manqué, neo-hippies, temporary settled backpackers. A fantastic place to get special souvenirs, consume option, smoke alternative and rhapsodise with bohemians. • Inca Museum, Unsaac Museo Inca, shows an incredible collection of products and information from pre-Inca civilisations through to the Spanish conquest, such as the biggest trove of Inca objects in the world. All of this is found in among Cusco’s most readily useful, half-Inca, half-Spanish Colonial structures. A little crude in places but essential for any person interested in the Inca. The flag of Cuzco is the official flag of Cuzco, Peru. It is a rainbow flag, supposed to be the flag of the Tawantin Suyu (cf. wiphala).